Television shows are at an advantage over films when it comes to character development. 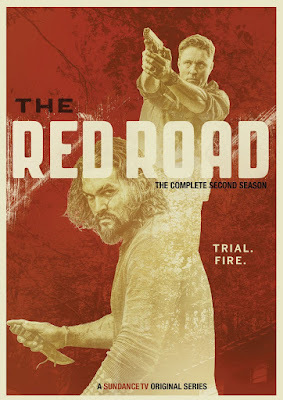 Even with minimal episodes in each season, as is the case with Sundance TV series “The Red Road,” more time is spent with the characters than would be in a film. There is also usually the opportunity for story continuation, though that chance ended for this show when it was cancelled after the second season. This is unfortunate, because this is the season that I truly became invested in these characters and would have likely returned for more episodes with them. Season two of “The Red Road” continues some of the storylines that were set up in the first season, including the questions about contamination in the mountain that is causing illness among the Native American tribe and a possible plan to build a casino in the community. After the shootout which closed the first season, Harold Jensen (Martin Henderson) has been promoted to lieutenant with promises of another promotion once his captain retires. Meanwhile, Phillip Kopus (Jason Momoa) has been released from serving a prison sentence and immediately gets caught up in more trouble. This time he seems to be acting a lot less self-serving, though his behavior in the first season still has many unwilling to trust him, including his younger brother, Junior (Kiowa Gordon). While Harold once again becomes trapped between in the criminal undertakings of the Native American tribe and the disturbing secrets of the town’s government officials, his wife (Julianne Nicholson) comes to terms with the limitations imposed on her life by the newly discovered schizophrenia. Their oldest daughter, Rachel (Allie Gonino), debates continuing a relationship with Junior, concerned that she may have inherited the disease from her mother. The youngest daughter vanishes from the narrative for much of the season, not that she had much of a storyline to begin with. The action is season two is not necessarily better, but it is spread out more than the first season, which essentially just had one explosive moment at the end. What makes this season more enjoyable is the development of the characters’ relationships with each other, especially the fragile alliance between Harold and Phillip. This probably could have been taken even further with additional seasons, but now we will never know. The DVD release of season two includes all six episodes on two discs, along with a couple of extras. The special features include a making-of featurette and some behind-the-scenes footage from the set. The largest problem with these DVDs is a lack of chapter selection within each episode. The only option is to skip backwards or forward an entire episode, which is frustratingly impractical.